ï¿½For months, I had been imagining the end of our circumnavigation. We would finally pass by the Fuca Pillar make our way into Neah Bay and have a good two days rest, or three, and get the boat all cleaned up. Our daughter wanted to meet us at the visitorï¿½s dock in Squalicum Harbor, Bellingham so she asked that we not get in until Sunday, June 24, as she lived in Portland, Oregon and needed to have the time off from work to be there waiting for us. We would drive up to the dock with all our courtesy flags from over 50 countries flying on the staysail halyard, banners from various rallies and events we had participated in hanging on the lifelines and personal burgees from different organizations raised up the signal halyards. I hoped to make a banner showing a globe with our circumnavigation route over the 17 years. There would be our daughters on the dock and maybe a few interested friends waving us in and then a celebration with champagne and M&Ms, a tradition we started back in 1991 in Costa Rica. Then we would toast our lifeï¿½s dream accomplished and rest on our laurels a bit before entering the next phase of our lives. Whatever that was, it would still certainly include boats. A completely different scenario took over. We had left Oahu, Hawaii on May 26, 2018. After weeks of watching the ï¿½highï¿½ develop in the north Pacific, we felt we could safely leave now and have reasonable weather for the 21-27 day trip to Bellingham, Washington. We sailed just west of the high and had somewhat rough conditions for several days, but that was to be expected. Uncomfortable, not dangerous for us. When we got to latitude 38 degrees north we were able to make easting in the westerly winds blowing on the top of the high. So far so good, all as planned, although still kind of rough for the most part with confused seas much of the time. On June 16, the winds slowly increased throughout the day. As we entered the night hours, we had winds well into the mid-30ï¿½s and seas were building. Still, Kelaerin was sailing fine, however, we were losing our direct line to Cape Flattery and making easting towards the Columbia River. The seas continued to build to over 4 meters, then 5 and now we were heading directly south with the waves on our stern, paralleling the coast, and sailing away from our destination. I awoke around 3:30 to first a hard hit by a wave, so hard it literally felt as though we had been hit by a train while sitting on the tracks. I was suddenly on the ceiling and tons of water came in through the companionway hatch. The noise inside the boat was deafening. I managed with some difficulty to swing out of the berth and when I put my feet on the floor I was standing in water up to my ankles. The water was sloshing violently back and forth and from bow to stern. I could barely comprehend what I saw. The aft cabin companionway ladder was across the cabin and bashed into the louvred door of the hanging locker. One of the two scuba tanks was out of their snap holders behind the ladder and sitting in the hanging locker. Jim called me from the cockpit and I answered him, telling him I couldnï¿½t get out of the aft cabin. (If I had needed to escape, it would have to be through the deck hatch over the berth.) I was able to move the ladder and the scuba tank from the doorway into the pass through. Everything that was on the quarter berth was now on the floor. Stuff had been piled there and secured for years for passages, but now was a heap on the cabin sole. But the second scuba tank was now in that bunk. We had a bag of laundry sitting in the shop that was behind the engine and all the clothes were sloshing around the cables and chains of the steering. The heavy, sliding doors to the engine room were bashed into the pass through. I had some difficulty getting those out of the way and navigating myself through the mess and now into the main cabin. The sight was so horrifying and complex that I could barely take it in. Almost every locker door was open or broken and the lockers were bare, with the contents sloshing back and forth on the cabin sole. The bilge hatches were gone ï¿½ they werenï¿½t always the easiest to get up with their pull rings -- and the water tanks exposed to view. Locker lids either flat or on the cabin sides were askew and shelves were broken. It just couldnï¿½t be possible that my beautiful boat, the one we had for 27 years and was so lovingly maintained, could look like this. I got to the main cabin companionway and saw Jim at the wheel. He had blood covering half of his face. He looked shocked but was steering us down a huge wave. I had a hard time taking this view in as well. I was looking at clear sky where once there had been a full cockpit enclosure. I asked, ï¿½Where is the dodger?ï¿½ and Jim just said, ï¿½Itï¿½s gone.ï¿½ He asked me to get on the VHF and put out a MAYDAY call. I felt strange doing this, even hesitated for a few seconds, as I never pictured us asking for help. We never had since our first time together out in sailboats back in 1978. We got no answer. He then asked if I could take the wheel, which I did while he went down below to check the damage and make sure we werenï¿½t taking on water. Then I realized something else was missingï¿½.the liferaft. I leaned over to see if it had maybe been caught in between the cabin top and the lifelines or blanketed by the main sail but it was not there. It had been tied to a stainless steel luggage rack that we had constructed and bolted to the cabin top just forward of the dodger. The teak coaming that ran across the cabin top was broken off with a part of it in the cabin. It was probably that which had hit Jim and gashed him above his eye. The mainsail had been spilled out of the stack pack and was hanging down to the deck and possibly some of it over the lifelines and I could see that it was shredded in places. All these things had compiled in my mind and unbelievably I was ledgering the costs of the damage and what it would take to fix all of this. Never had I thought that at the end of our voyage we would have to rebuild our boat. Jim appeared at the companionway and said that the SSB radio was dead. The two VHF radios were on but since no one answered our MAYDAYS we werenï¿½t positive they were sending out our messages. He was pretty sure, he said, that we werenï¿½t taking on any more water. It had been almost two hours since the wave had tossed us now and we were both showing signs of hypothermia. Jim said my lips were turning blue and the blood caked on his face looked ghastly. I was doing o.k. with steering but every once in a while a bigger wave broke near me and we would begin to broach. I had to hold on to the wheel with everything I had to keep it stern to. I screamed now and then. I know this because my voice was getting hoarse. We were in very dangerous shape now, with no communications and no way to get a weather report. No one was answering our MAYDAY calls. The boat was seriously damaged and we had tons of water going back and forth in the cabin. Things that had been in the aft cabin, including our spare Aries windvane which was tied down beneath the aft cabin berth, had been propelled incredibly through the walkthrough and into the main cabin and had managed somehow not to hit me when I was still in the bunk. I wondered why I saw the carton of milk on the cabin sole, the contents of our refrigerator and freezer scattered about the boat. The refrigerator lid was heavy with a pull ring and it took a little doing to get it up in normal conditions. Jim assessed that we had been turned upside down. When the wave hit, he was wearing his SoSpenders but not tethered. Jim has great reflexes, thankfully, and said he had to hold on to the steering pedestal with all his might or he would have gone over. In retrospect we donï¿½t think the tether would have helped seeing as how so many other things had been ripped off the boat. He described the enclosure as shredding and blowing off like newspaper in the wind. Later inspection showed that the pedestal had broken at the base. It was lucky we had steering at all at this point. When he lifted the chart table lid there was nothing in it now, except a lone can of tuna fish. Nothing was dry, the stove was broken and the water tanks were probably fouled through the vents. The engine itself may have worked but the starter motor was surely dead as it was now underwater. The engine wouldnï¿½t have helped anyway, not unless we could get closer to shore and now we were getting farther away every minute. We had 4 electric bilge pumps, one was a large capacity pump. All 4 clogged with debris. The debris was from all the soft back books we had on board. The cheaper paper turned to mush with all the sloshing and went right through the screens into the pumps. There was no way we could operate the manual pump in these conditions and to get that much water out. While Jim was describing this to me, I kept looking over to where the liferaft had been. Then the reality of our situation seemed to be clear to both of us. I said, ï¿½I think we should activate the EPIRBï¿½ and he agreed. We had a 406 Mhz EPIRB and he went to get it out of its holder and brought it up to our binocular box on the cabin (the binoculars were gone) and set it in there and and pushed the button. We couldnï¿½t be sure that anyone would be able to get to us or hear us. We had the EPIRB properly registered and overhauled with new batteries every few years as required. Originally we had our daughters on the contact list, but we got frustrated with trying to get them at times. It could be days before we ever heard back and that could happen while we were in distress. Jim had asked old buddies of his if they would be contacts. Ed was a HAM radio operator and Richard was a tugboat captain. Both of these guys were in almost daily contact with Jim through winlink and Jim would report our position to them and the sea conditions. We had set off the EPIRB around 0538. 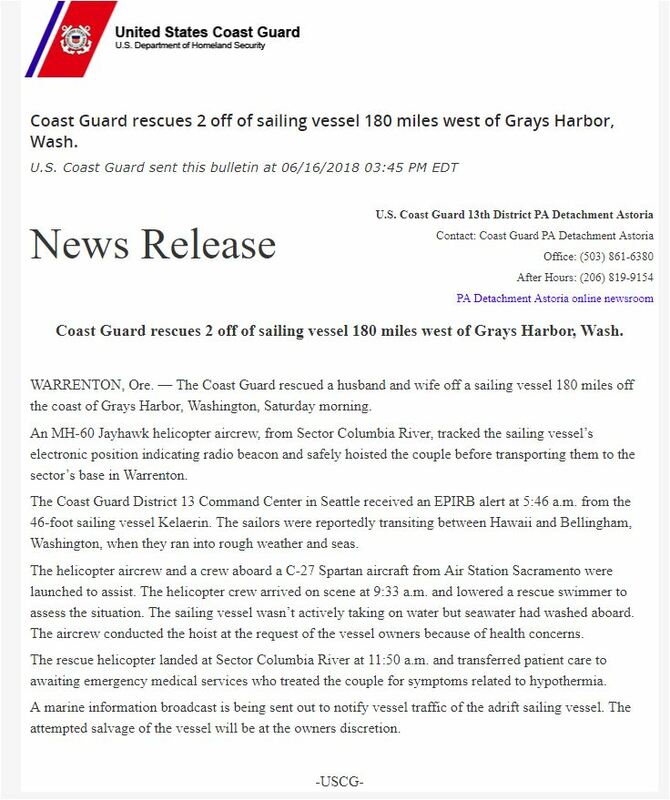 The coast guard immediately contacted Ed and Richard to verify that we were indeed in trouble and they reported back our position the evening before, our course, our destination and that we had reported rough conditions. Then they went into action. Almost 4 hours later, as I was at the wheel, I heard the Coast Guard call us on the old VHF radio in the aft cabin. I reached in to answer, ï¿½This is Kelaerinï¿½, and immediately felt we just might survive this ordeal after all. They were coming from the Warrenton, Oregon base. They said they were 20 minutes away from us. I told them that incredibly the chart plotter was still functioning and I could give them our exact position, which I did. They informed me that when they arrived they would have only a few minutes with us and we needed to make the decision: they could give us a dewatering pump and we would be on our own or they could extract us from the vessel. I looked at Jim and asked, ï¿½which?ï¿½ and he answered, ï¿½the dewatering pumpï¿½. Still at this point, I did not envision us leaving Kelaerin. The pilot radioed back that we had to think about that and have our possessions we wanted to take with us ready to go. Jim got back on the wheel for awhile while I changed clothes (a few things were still dry) and I went about the boat collecting hard drives, cameras, etc. This was much harder than I had anticipated. I could not get over all the stuff floating around inside the boat to get to the box where our passports and cash were. Jimï¿½s wallet had been in the chart table and was just gone. My backpack which held my wallet was nowhere to be seen. Jimï¿½s good Nikon camera was in a locker up forward with all kinds of stuff blocking the way. I got the hard drives, the go pro camera and the little Nikon Coolpix I used. Jimï¿½s new LG phone was gone but mine had survived. I had a small dry bag and stuffed everything I could in there. Jim had gone up to get the cash but when he went into the cockpit he pulled it out of his pocket and the cash began flying in the wind out of his hands. I stuffed what was left into a small cooler. Then I went back to steering while Jim continued to try and get water out of the boat. The Coast Guard continued to call me asking me to count down so their RDF could locate us. For a while I wondered if they would find us in time, but eventually I saw them coming. They informed me that they would drop a swimmer in so I told them we would lower the stern ladder and Jim would stream a heavy line so the swimmer could grab it. I informed them that I was going bare poles at 4.6 knots at that time and there would be no way whatsoever I could turn around. Iï¿½m sure they already knew that. I asked if they would drop the swimmer on the port side of the boat as the mainsail was blocking my view off the starboard side. The helicopter dropped low, on the starboard side, and the swimmer jumped in but I could not see any of this, only the blades as they whipped around near me. I was not aware when he came aboard. I kept looking for him not realizing he had already boarded and was discussing the situation with Jim at the stern. I was waiting for the pump and then looked over to see the Coast Guard swimmer coming towards the cockpit and informing me that we were getting off the boat. ï¿½No,ï¿½ I said. ï¿½We are staying on the boat, we just need the pump.ï¿½ Then Jim was behind him and said, ï¿½Joy, we are getting off.ï¿½ I was incredulous. It was beyond comprehension that we would ever leave the boat. I still felt that, although, we were in serious trouble here, that we could save Kelaerin. How could we possibly leave her, after nearly 70,000 miles of cruising and 27 years together with only 150 miles to go? Jim had always said he wouldnï¿½t abandon the boat unless he had to step up into a liferaft. So when he confirmed the Coast Guardsmanï¿½s declaration, with all his experience at sea, I knew finally that this battle was over. The sea had won. Then everything went at hyperspeed. The Coast Guard swimmer said I had just a minute to go and gather my things. This is when good sense left and stupid crazy set in. Since we had not planned to leave the boat, I was not prepared well at all. I ran down below, threw out the computer, my ï¿½pink bookï¿½ with all our personal and important info in it, my dry bag, and the red cooler into the cockpit. The CG had taken over the wheel and he kept telling me to be quick, ï¿½Go, go, goï¿½ he said. I ran back to the aft cabin (this was when nonsense set in for a bit) to retrieve some jewelry. Later I couldnï¿½t believe I had done that as it had taken precious time when I could have better secured the more important items. I threw out my forearm crutch which I needed to walk and he was now telling me there was no more time and I had to get back to the stern of the boat. I asked, ï¿½what about my computer and the red cooler?ï¿½ and he said he would get it and urged me back. Jim grabbed the red cooler and threw it towards the stern and it lodged out of my reach. I again said, ï¿½I need my computer and the red coolerï¿½ and the CG swimmer said, again it was OK. He told us to inflate our sospenders and jump. What!!!!! Of course this was the only thing to do, but I hesitated for a second and looked at the giant wave coming at us and said, ï¿½Iï¿½m not jumping in thatï¿½ and he said GO NOW, Jim said JUMP and I was in the water. Jim later said he had never seen me swimming so fast. I just wanted to get to that basket being lowered before a wave tumbled me under and I might possibly never come back up. Getting into the basket was easy, I just rolled in and moments later I was in the helicopter. The basket lowered again for Jim and he was helped out into the helicopter. Then the swimmer came up and I was hoping that I would see the computer and the red cooler but, of course, it wasnï¿½t there. I knew it wouldnï¿½t be there. The doors were closed and we started to fly away. I had to restrain myself from shouting that I wanted to go back. The hardest moment of both Jimï¿½s and my lives were when we could see Kelaerin through the window and we both realized she was probably lost forever, that somehow we had failed her when she had been so good to us for so many years. When we were about to land Jim heard the pilot tell ground control that they were landing off base at an alternate site near Astoria as they were down to one minute of fuel. ONE MINUTE!!! They had been at the far extension of their range when they had reached us 180 miles out to sea and no time to spare. When we disembarked the copter, I hugged all four Coasties, Jim shook their hands. 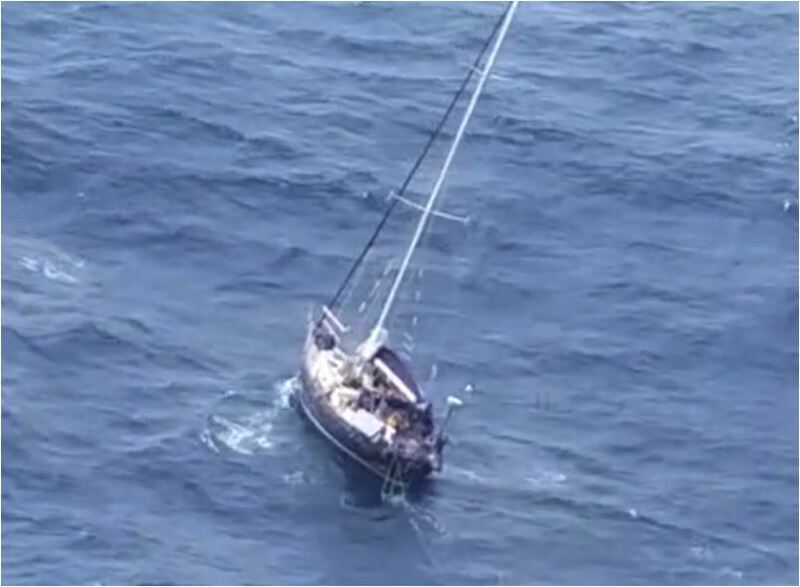 The pilots came around with smiles on their facesï¿½.a job well done, a successful rescue. Then they told me that I was pretty cool on the radio and it helped them a lot. Thank God, I did something right. The EMTs were waiting for us and now I realized we were without any ID whatsoever, we were soaking wet and shivering, no shoes for me and I didnï¿½t have my forearm crutch so I had to be supported across the tarmac to the ambulance.